We have come a long way in our infrastructure technology journey. The journey began with companies owning their own data centers, servers, software and resource. 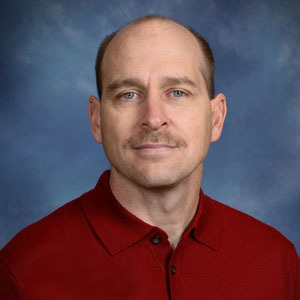 We then evolved to ASP models and COLO Data Centers on the facilities side and virtualization on the server side, which opened the door for the private cloud. The latest step in the infrastructure transformational journey is public and hybrid cloud adoption. 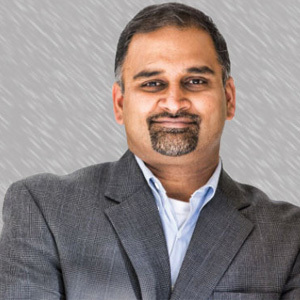 The evolution in public cloud infrastructure services and the container technologies has provided the fuel to propel organizations forward, many leap frogging their competitors by leveraging this transformation. Companies who have been successful at embracing the journey to the public cloud have done so by moving beyond their traditional approaches and fully embracing a cloud native approach. Without this transformation it will be very difficult to realize the benefits of a public cloud strategy such as: Improved time to market, organizational agility, reduced risk/cost of failure, improved operational efficiency and the associated savings in labor this efficiency provides. The only constant along the journey is change. We have a choice to adapt or die. So, we adapt…our tools, processes, knowledge and skills. It is survival of the fittest in the technology jungle. Most who die along the journey don’t die from technology issues, they die from inability to make the organizational transformation. What do you need to know for your organization not to be captured as another entry in the fossil record? Complex heterogeneous infrastructure ecosystems such as big data processing/ machine learning systems / MPP analytical systems etc. This could cause a lot of complexity in the future. To create an analogy, when the industry went through the phase of the Physical to Virtual(P2V) migrations and enabled virtualized platforms over raw /bare metal infrastructure via VMware, Microsoft and Xen’s virtualization technologies, an ecosystem of tools / processes were created to support the steady state operations. These tools stood alone or integrated into the enterprise suite of tools and over the period of time became the standard mechanisms to provision/deprovision virtual machines, add / remove storage, patch/upgrade operating systems etc. Cloud native adoption is a strategy to embrace the toolsets and technologies that are readily available in the Cloud service provider’s ecosystem or through a market place vendor. This is extremely similar to the approach most enterprises took with VMware toolsets with P2V migrations. Cloud Native thinking stems from carefully analyzing the use cases and applying the right technologies that are comparable to provide current / existing functionality and satisfies the operational, security, monitoring and compliance requirements. What is Cloud Native Adoption? Cloud Native adoption is an approach to look for services and technologies natively provided by the Cloud service provider and replace existing/legacy third party hardware or software tools used in enterprise environments.A simple3-tier web application will use very different deployment models for on-prem and cloud. 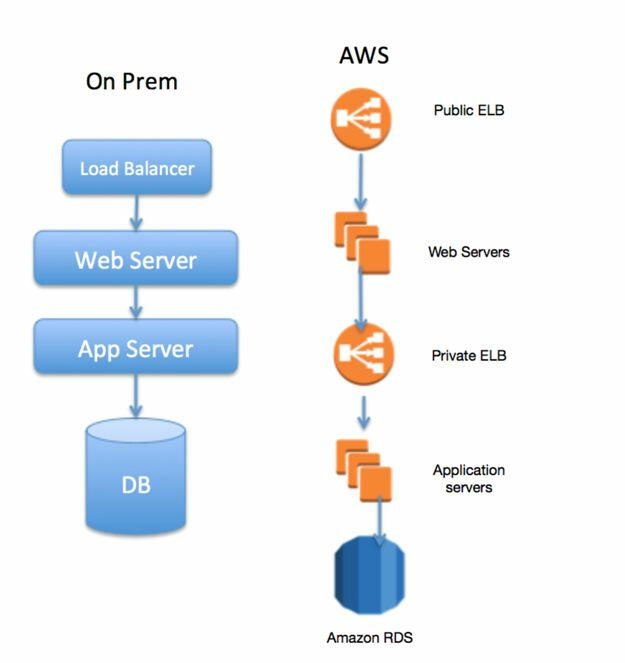 The components in AWS that will enable core infrastructure service qualities such as hardware load balancing, clustering, fault tolerance/high availability and scalability are very different than the ones that would be used in an on prem deployment. The technologies available as cloud native options provide and guarantee advertised SLAs and due to economies of scale (wide adoption of consumers) are priced very competitively. The following table shows a comparison of such options between an enterprise on-prem infrastructure and AWS as the cloud service provider. 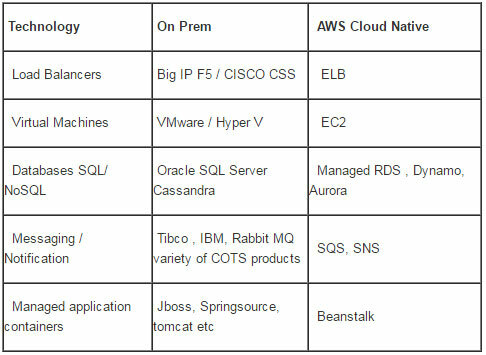 The following table provides a brief summary that compares and contrasts on-prem vs AWS cloud native option. Managed RDS – Oracle/SQL/MySQL/PostGre, Dynamo DB, Aurora. Vmware scripting, Shell scripts, Product based automation scripts. VPC, Data in Transit protection using TLS,S2N and Data at Rest protection using AWS CloudHSM, KMS and third party encryption technologies. So, what are the keys to survival in the technology jungle? The simple summary is that every wave of technology that is introduced must be adopted in new and extended dimensions to reap the promised benefits. With the public cloud it is not enough just to pick up your existing solutions and run them in the cloud. We need to change our thinking. We need to think cloud native in our application development, infrastructure solutions and operational processes. We need to evolve our organization to embrace the devops capabilities that are now available. The key to success or failure is not in the technology alone. Your success is dependent on the ability to make technology and parallel organizational transformations to reap the full benefits of Cloud services.